In Rise of Kingdoms game, the player builds its own Kingdom and build a strong army of high-tier troops lead by powerful commanders. Players can attack each other cities and loot their resources. The game also lets you join an alliance that provides many benefits to your Kingdom. Rise of Kingdoms features PvE mode, PvP mode, wars, alliance battles, and much more. Our today’s Rise of Kingdoms guide and Rise of Kingdoms tips, cheats & strategies will help you master the game! Use the quick navigation links to view particular content directly. In Rise of Kingdoms, you can build a variety of buildings in the kingdom. These buildings include training centers, production centers, alliance facilities, research facilities, commander recruitment center, and many more. To build these facilities or use these facilities, you need resources; food, wood, stone, and gold. Every player wants to grow its kingdom and it can not be possible if you don’t have enough resources. In the early game, you don’t feel the shortage or scarcity of these resources because of low-upgrade cost, building cost. But, as soon as you reach the high-level, the upgrade cost will increase and you will need a huge amount of resources. So these are the ways to increase the power of the city in Rise of Kingdoms game. Let’s learn about the buildings in Rise of Kingdoms. In Rise of Kingdoms game, there are two types of buildings; economy buildings and military buildings. At the bottom-left corner of the game screen, tap the hammer icon to check the buildings. You can switch between three tabs; economic, military, and decoration. City Hall is the main building in your Kingdom. If you upgrade the city hall, new buildings or the maximum limit of building a specific building will increase. Also, troop dispatch queue, troop capacity, and the Kingdom’s power will increase. As you upgrade the city hall to the next levels, you will enter a new era every certain level. By default, the Kingdom starts in the Stone Age. Goldmine – Gold is one of the resources in RoK. You don’t need this in the early game. As you progress further, you need the gold for scouting, Kingdom development. Goldmine produces gold. Academy is one of the main buildings in Rise of Kingdoms game. In the academy, you can research two types of technologies; economic and military. After building the academy, tap it -> research(potion bottle) -> a new window will open where you can see the technologies. There are two tabs on the left side of this window; economic, military. In the economic tab, you can search the technologies related to the production of resources, troop load, research speed, gathering speed, and more. 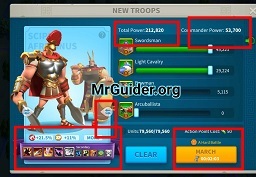 In the military tab, you can see the technologies related to troops, training speed, new troops, attack, march speed, defense, and more. Storehouse is another main facility in Rise of Kingdoms. As you know that other players can invade your Kingdom anytime and steal the resources. This storehouse protects the resources; food, wood, stone, gold. But there is a limit. It can not protect the whole treasure. You can upgrade this facility to increase the protection capacity. When you join an alliance, you can ask for help. For example; In the building, upgrading, research etc. When the player asks for help, this facility shows a helping hand icon. Tapping this will help the player. Basically, the time for upgrading/building/researching will reduce. If you upgrade this facility, you can increase the number of times that you can be helped and the reinforcement troop capacity. Players in an alliance can help each other by reinforcement(Send your troops to another player). To reinforce, tap the menu button at the bottom-right corner of the game screen and then tap the alliance option. After that, go to the members tab(on the left side of the alliance menu screen, there are three tabs; alliance, members, settings). Tap on a member name and choose to reinforce. After that, tap the + icon -> send the troops. So this is how you reinforce in Rise of Kingdoms game. The shop allows you to purchase the resources, boosters, speed-ups, and other items; arrow of resistance, master’s blueprint, book of covenant, rename card, talent reset item, Kingdom change, keys, teleport, and builder. It will cost you red gems. This is where your builder lives. To increase the building queues, build this facility. However, there is a certain limit that you can not pass. This is where you can see the history of the kingdom; complete these chapters to get precious rewards. Using this facility, you can send the resources to other players in the alliance. In Rise of Kingdoms game, the mysterious NPC/merchant sells resources, speed-ups, boosters, and other items. You can buy these items in exchange for resources or gems. The tavern is the facility where you use the keys to unlock two types of chests; silver chest, golden chest. You can get commanders, resources, sculptures, resources, boosters, items from these chests. Tap the tavern facility -> search(magnifying glass icon) -> open the chests. In the tavern menu, at the top-right corner, tap the (i) icon to check the rewards list or drop rates. This is where the scouts stay in Kingdom. These scouts can help you to know about the kingdom/enemy that you are about to attack. When you tap an enemy city, you get the option to scout. Send the scouts and you will get the details such as defense, resources, level details, and more. You get the scout report in the mail menu. In these buildings, you train the troops. You can unlock high-tier troops or new troops by researching in the academy(military technology). When you attack someone or you get attacked by someone, troops may get injured. Injured troops can be healed in the hospital. If you upgrade the hospital, capacity will increase. On the world map, there are many barbarian forts. A solo player can not attack these forts. To attack these forts, you need to start the rally attack. To increase the rallied army capacity, you will have to upgrade the castle. From these rally battles, you can earn book of covenant, keys, red gems, tome of knowledge, and many more items. Here you get the update and event details of Rise of Kingdoms game. So this is the Rise of Kingdoms guide to buildings. Let’s have a look at Rise of Kingdoms guide to the commanders. Rise of Kingdoms game features 34 commanders. All these commanders have a unique skill, traits, talents, and stats. You can set these commanders on defense and when you go on an attack, you can add two commanders; primary commander and the secondary commander. How to set the commander on defense? Tap the wall of your Kingdom -> tap the defense icon -> tap the empty slot icon -> choose commander. These commanders will fight against the enemy who attacks the Kingdom. You should set the commander on garrisoning position who has the garrison skill. Tap the menu button -> tap commanders -> select a commander -> under the name of commander, you can check the commander’s traits. In the tavern building, open the chests and you could get the commanders. Tap the (i) icon at the upper-right corner in the tavern menu to check the commanders list or their drop rates(probability). How To Level Up Commanders In Rise of Kingdoms game? To level up the commanders in RoK, you need to give them XP. There are two ways to grant XP to commanders; from the battles or using the tome of knowledge item. You get the tome of knowledge item from the quests, by defeating barbarians, from the chests, and shop. To use the tome of knowledge, tap the menu -> commanders -> tap the commander -> tap the + button next to the commander’s XP bar. Via Battles – When you get the victory from the battles, commanders earn XP. How To Upgrade The Commanders? Once the commander reaches its max level, he/she will not earn XP from the battles until you increase his/her level cap. To increase the level cap of a commander in Rise of Kingdoms, you need sculptures. Menu -> commanders -> tap the ⇑ icon next to the stars -> add sculptures -> confirm. You get these sculptures from the chests, courier station, quest reward, and the shop. As we mentioned above, all the commanders have unique skills. As you upgrade the commander stars, new skills will get unlocked. You can upgrade these skills using the sculptures. Menu -> commanders -> commander -> tap the skills button -> upgrade. You need sculptures to upgrade the skills. And, the game randomly upgrades one of the unlocked skills. When you develop the commanders, you get the talent points. You can spend these talent points to unlock/upgrade the talents of commander. Menu -> commanders -> commander -> tap the talents. You can spend these points on developing a trait. For example; if the commander has three traits(you can check the traits under the name in commander menu), you can spend these points in developing these traits. Tap the trait to get details. For example; if you want to use the commander as a garrison unit, spend these talent points in garrison trait/row. Tap on any talent to get the details. In the commander menu, select a commander -> tap the (i) icon at the top -> here you can check the commander’s rarity; epic, elite, legendary, and advanced. The higher the rarity is the more difficult it would be to upgrade the commanders. For example; To upgrade these commanders, you need sculptures. And, you get these sculptures(epic, elite, legendary, advanced) from the chests or by completing the quests. The drop rate for high rarity sculptures(legendary) is quite low. So we would recommend you to progress with the commanders who can be developed easily. For example; If you progress with a legendary commander, you will rarely get its sculptures and upgrading it will take a long time. Hermann – Hermann in Rise of Kingdoms is one of the best garrison commanders. You can deploy him to garrison the Kingdom. Scipio – Scipio is one of the best F2P commanders – PvP. It would be better to pair him with Boudica or Joan of Arc. Pelagius – He is a great cavalry commander(cavalry attack/defense bonus). Combos – For PvP, we would recommend you Boudica + Scipio Africanus. For PvE – Boudica and Lohar. Campaign – Tap the menu -> campaign. The campaign mode features two game modes; Ark of Osiris and Expedition. Expedition – In this mode, you complete the stages and earn medals. You can exchange these medals in the exchange shop(tap the shop icon at the upper-left corner in the expedition menu). Ark of Osiris – Ark of Osiris mode is only available to the top alliances. World Map -> Zoom-out on the main game screen and you will see the whole Kingdom word. Or tap the map icon at the bottom-left corner -> tap the search icon just below the quest panel -> if you want to attack barbarians, choose barbarian -> choose a level -> search -> attack. In addition to the barbarians, you have more options; cropland(gather food), logging camp(gather wood), stone deposit(gather stones), gold deposit(gather gold). You can send the troops to these points and gather the resources. Apart from these fixed functions, you can manually search for other players’ kingdom, barbarian fort, and alliance. We would recommend you to choose Germany as it offers +5% troop training speed and +10% action points recovery speed. So this is the Rise of Kingdoms guide for the rookies. Let’s have a look at our top Rise of Kingdoms tips, cheats & strategies! We’ve already discussed in the guide above how to increase the power; upgrade the buildings, commanders, train the troops, and research the technologies. You have to focus on these aspects to increase the kingdom power. If you want to send more troops in the march, you will have to upgrade the commander. The total troop capacity that you can send in a march depends on city hall level, commander skills, and the commander level. You get red gems by completing the quests, from random reward, from the battles, alliance gift(chest reward). We would recommend you to spend the gems in upgrading the VIP level. The Rise of Kingdoms VIP offers many benefits. At the top-left of the game screen -> tap VIP -> claim the reward/chest -> read the exclusive buffs. Tap the + icon -> spend gems to get VIP points(required to increase the VIP level). Send your troops on the world map to gather wood, food, and stones. You will need these resources to grow Kingdom. It’s better to do it multiple times daily. You should join an alliance if you want to grow fast. If you join an alliance, you can seek help from the members, share the resources, get reinforcement, gifts, free chests, and much more. Also, it would be better to move to the alliance territory. Your alliance will get the benefit when you gather the resources inside the alliance territory. Also, you can start rally attacks and earn gems, book of covenant, keys, and many more items. If you complete all the daily objectives, you will get one golden key, 100 gems, magic box, epic commander sculpture, silver key, the tome of knowledge, action point bottles, and much more. Complete all the expedition stages with the 3-star and you can claim the rewards instantly. Tap the chest icon at the upper-left corner in the expedition menu. You can exchange the medals in the expedition shop for sculptures and other items. So these are the top Rise of Kingdoms tips for the beginners from our end. If you have more tips, comment below! Next Post:Era of Legends Best Class – What Is The Best Character Class? In your guide, you mention Lancelot but you do not explain how to use him. Do you think you could post a guide that goes in-depth on different commander combos? I would really appreciate it. @Briana Lancelot has mobility buffs, you can use him for speed or pair with Pelagius. He is a great cavalry commander.